The Philippines, in a bid to join the race of nations building the world’s tallest man-made structures, is planning to open the world’s second-tallest self-supported tower by 2019. This has been confirmed in an exclusive interview with Quezon City’s mayor Herbert Bautista conducted by Investvine. According to Bautista, proposals for the project, which has been announced back in July 2014, are currently studied after Japan’s Mitsubishi Electric Corp. has been given the green light to set up the 612-meter tower in a seven-hectare lot along Quezon Avenue, a major thoroughfare of the city. “I hope we can break ground on the project in the middle of this year with a view to complete it by 2019, which would mean 3.5 years of construction time,” the mayor said. At its total height, the tower – called Philippine Diamond Tower – would be the country’s tallest structure and the second tallest self-supported tower in the world behind the Tokyo Skytree, which measures 624 meters in height, and ahead of the Canton Tower in Guangzhou (600 meters) and the CN Tower in Toronto (553 meters). The tower in Quezon City will mainly be used for telecommunication and observation purposes, but the plot where it will be built will also house an international convention center, a five-star hotel, a shopping mall, restaurants, a disaster-risk management center and a garden park. On the top of the tower, equivalent to a height of 200 floors, there will be an observation platform. “The primary objective for this tower is that it would play a crucial role in disaster management as the scope of the tower’s transmitters would allow it to cover 6 to 7 provinces on the island of Luzon – so they are easily able to communicate emergency broadcasts,” Bautista said, adding that it will also support the country in its shift from analog to digital broadcasting technology with major TV and radio stations ready to collaborate. “And it is also done for tourism purposes as the tower would be a natural landmark and put Quezon City on the global map,” he added. Construction costs for the tower and related buildings have been set at 15 billion pesos ($335 million), which for many looks a bit too moderate for a project of this scale. However that may be, the project is covered by a loan from the Japan International Cooperation Agency’s Official Development Assistance at 0.9 per cent interest per annum payable in 40 years with a 10-year payment moratorium, according to the Quezon City treasury. 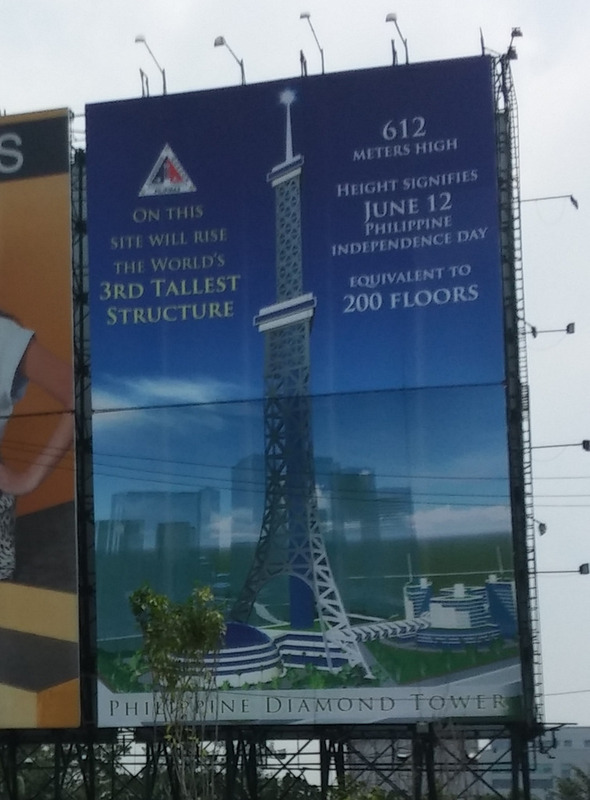 However, the Philippine Diamond Tower has not been undisputed which is why original plans to open it already in 2016 had to be changed as confusion about land ownership of the plot and opposition by the National Housing Authority of the Philippines delayed the start of groundworks.